The existing public sewer, dating back to 1910, was old earthenware pipe and showed signs of severe root infestation. The pipe also had a poor alignment as it passed underneath the house at 46 Jackson Street. 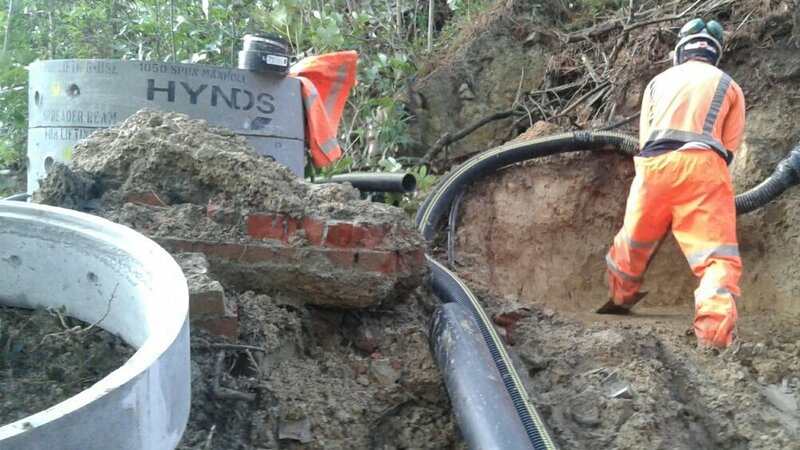 The opporutnity was taken to realign the drain clear of the ouse and renew the old pipe with new HDPE pipe. These works were some of the most difficult, complex and straight out frustrating works ever undertaken by CCL. We now look back on this as one of the most satisfying jobs we have ever completed. Hand digging, open trenching, trenchless renovation including pipe bursting and directional drilling in private property and road carriageway. 45 metres 160 OD PE 100 SDR17 pipeline installed by directional drilling around the dwelling at 46 Jackson Street. 75 metres 160 OD PE 100 SDR17 pipeline laid by hand digging on existing alignment within private properties Jackson to Volga Streets. 95 metres 160 OD PE 100 SDR17 pipeline laid by open trenching on new alignment within road carriageway private properties at Volga Street. Plate compactors – 700kg, 400kg and foot whackers. Tools and equipment – Pipe lasers, Quick cut saws, Tripod and Harness - Gas Detectors, Generators and small power tools. Winch for bursting, Compressor, Pipe welding equipment. Our ability to resolve design issues on site. By having a good partnering relationship with the consultants we felt trusted and were able to advise on several design matters. Design and build of the timber bracing to protect the brickwork and existing retaining walls, all provided by CCL. We ran the design past the engineers to make sure the loadings were right. Use of 'tunnels' under a hedge and a concrete path to reduce reinstatement cost and help protect the environment. Using the pipebursting FREAKING HEAVY winch as a labour saver to help move a heavy welded pipe string into place. The contract period was 10 weeks, commencing in June 2016. We knew that good planning and programming would be necessary to meet a tight deadline. Dan and his team worked successfully on the critical path activities to ensure key milestones were met and that all activities were completed at the right time. The contract was completed on time, allowing for bad weather and variations. The general conditions of contract were NZS:3910 which had been heavily modified by the client. There were no major contract issues. The project was completed on time, and within budget. Variations were minor and no liquidated damages were applied to this contract. We maintained tight financial controls by coding all material and labour costs against projects/activities on a weekly basis. There were significant variations to the contract due to variations. The final project cost was around $490k, including approved variations. There was a serious near miss recorded on 22 June 2016. As the site was being closed up for the night a car came through Volga Street travelling at very high speeds, narrowly missing an employee. The driver didn’t slow down and sped off before his number plate could be taken. We identified some skills and training gaps that were addressed before and during the contract. Staff also used the experience gained during the contract towards achieving Industry Training Organisation qualifications. Dan, Cody and Matt Kerr gained experience towards their NZQA National Certificates in Water Reticulation Supervisor Level 4 qualifications. At CCL we value and encourage working as a team. We hold regular team training sessions every week on a Monday morning for all staff to get together for “Smarten Up” training. Cody and Clint both gained valuable on the job training as machine operators cutting a track in difficult, steep and slippery conditions at 51 Volga Street. The steep slope and constrained site tested their limits as experienced operators. The finished result (a safe and workable access track) is a credit to them both. Mike Z also commented that as a new member of CCL, he appreciated the good experience and teaching from seniors. Quality records for monitoring levels were maintained in our Contract Quality Plan. CCL performed most of the work in-house with specialist works requiring subcontractors. We used our regular sub-contractors, mainly Smythe’s, who we have been using for many years and had no issues. We maintained good relationships with our subcontractors and inducted them into our H&S and Quality Plans. They signed into our Daily Toolbox sheets so they were made aware of the day’s activities and hazards and how the hazards were to be managed. CCL also conducted random weekly audits of subcontractor performance through our Weekly PWSSA site safety audits. No issues were identified. For the most part, weather conditions for the contract were cold, wet and miserable. This made the job much more difficult as you generally do not want to be working in private property making mud. CCL’s policy is for full cover protective clothing. The weather was terrible: cold biting winds and periods of rain. Just for a change, CCL’s “full cover” policy was popular with the guys, trying to keep warm and dry in these bitter winter conditions. Keeping the guys warm (with hot cups of tea at smoko) was a priority and we kept an eye out to make sure nobody froze. There were a few days lost to rain. A working construction site in private property requires special skill and attention to detail in order to cause the least amount of disturbance to the residents and the environment. Particular care was taken in planning for the protection of private property, good “housekeeping” and the continuation of sewage services during the contract period. While space and access was tight in many places, we overcame the challenges posed by site access and location. We minimised the amount of reinstatement work in private property required by limiting our occupation of site to the bare minimum to get things done. The access down to the back of 36 Volga was virtually non-existent. A skinny, steep and slippery track suitable for mountain goats winds its way down….no chance for any machinery access. Hand tools, digging and muscle required all the way. Our guys open trenched, by hand from LHCE 3 To MH4. Two manholes and two cleaning eyes were installed. All materials, risers, concrete was rolled or hand barrowed down. The “worst of the worst” was having to take barrows of unsuitable material back up onto Volga Street, up the mountain goat track. We reused what we could; the rest had to be removed from site by wheelbarrow. All of this was done with hard physical labour in mostly bad weather conditions. It was so tough that three temps only lasted one day and did not come back to work the next day. It didn’t break our boys though…. it made us stronger!!!!!!!!!!! Ground conditions were variable with a lot of weathered greywacke. The excavated material was beneficially reused wherever possible. We complied with our site specific environmental management plan and did our best to leave things better than we found them. We took care to control the runoff from 51 Volga Street so that silt was not released into the stormwater system. We installed a silt fence at the boundary with Volga Street and it worked very well to prevent pollution. While directional drilling, under pressure and uphill, drilling fluid started to frack out….everywhere! It looked like chocolate milk, and it managed to find its way to the surface at all sorts of unpredictable places. We did our best to contain the drilling fluid. We built small dams, allowed the fluid to pool and dry out. Then we removed the remains. We also had our sucker truck on standby in case things got out of hand (they didn’t). We cleaned up and there is no sign of any drilling fluids anywhere on site. We finished on time allowing for approved variations and so no liquidated damages applied to this contract. Yes. The engineers and clients were grateful that CCL went the extra mile to help resolve design issues. Contractor involvement in design made the job possible. The project was finished on time, within budget and finished to a very high standard with all quality assurance tests passed. CCL considers that the ratepayers of Wellington City have received excellent value for money through the renovation of these public sewer mains. The final job cost was under $500,000. Working in private property with the owners present is never easy and presents a completely different set of challenges to a typical construction site. We had to try and minimise disruption to the owners and neighbours and also maintain access (pedestrian and vehicle) throughout the duration of the contract works. On the whole we found that the designers had underestimated the amount of disruption the works would cause and as a result, the residents didn’t have a clear understanding of what the works would involve. Good communication was essential to the process and we managed to gain their confidence and negotiate suitable working arrangements with all the residents to get the job done. We took the lead in communicating well with the property owners and the neighbours who would be inconvenienced by our operations. We worked hard to establish good working relationships and partner with all stakeholders involved. All work was completed in accordance with a contract specific quality plan developed under CCL’s Quality Management system TQS1: 2005. The pipes were installed to the contract specifications and properties reinstated to best trade practices. Reinstatement was completed to a high standard to the satisfaction of the client, engineer and residents. Yes, a quality project delivered by CCL. The work was completed in a timely manner. We had to break a few eggs to make an omelette but the properties have been left better than when we arrived. Established gardens and plantings look great. The new asphalt, grassed lawns and landscaping looks great and the overall appearance is to a high standard. We successfully partnered with Wellington Water Limited and engineering consultants MWH for this project. CCL takes pride in its ability to work with consultants and principals, where all parties have a responsibility to ensure the end result is of the highest quality. We at CCL believe we have partnering values that recognise the importance of the customer and end user, and that we go the extra mile to provide excellent customer service. The residents are delighted with the end result which epitomises our motto to always try to leave things better than when we found them, proving this to be a multi award winning job.